Digital Imaging and Photography: A little history Part 2. To make ‘new’ pictures, I had to challenge some of my prejudices around art making, well at least less “cool” way of dealing with ideas. I had to develop a less cynical way of seeing. The first art that made me sit up and take notice was the work of Ross Bleckner. His work seemed to sum up the feelings that I had about culture. The paintings that Bleckner produced seemed to sum up melancholia and a rather doubt ridden outlook. This is a misreading I think, but the qualities Bleckner seemed to sum up in his work, presented us with an “optical art” to counter Duchamp’s influence and what Gilbert-Rolfe called “Duchamp’s myopia” (15, pp.13-25). The deadpan art that dominated much of the eighties and nineties had waned in its influence on me. Below Bleckners Oceans, 1984. 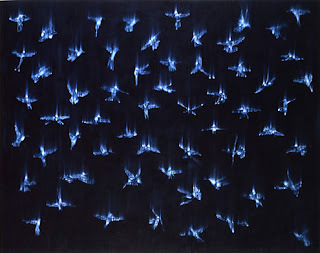 Below is Bleckner’s Falling Birds 1994. 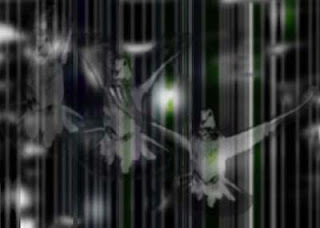 The other area of interest, not unconnected with Bleckner was the sublime and the possibilities that a relatively new medium, a digital medium could bring to it. 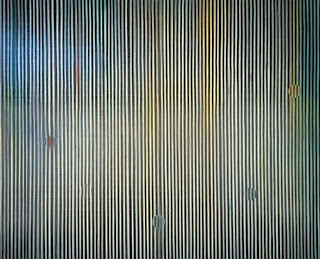 Bleckner’s influence was extreme and heavy (side stepping Bleckner’s own influences, notably Brigritte Riley, too new, too rigid) and I created a series of stripe or zip pictures. This evolved after some experimentation into my first real digital picture Ornithology. Ornithology tapped into areas of history that in my youthful ignorance I had neglected, ignored or just forgotten: the bird emblem belonged to the work of Max Ernst.